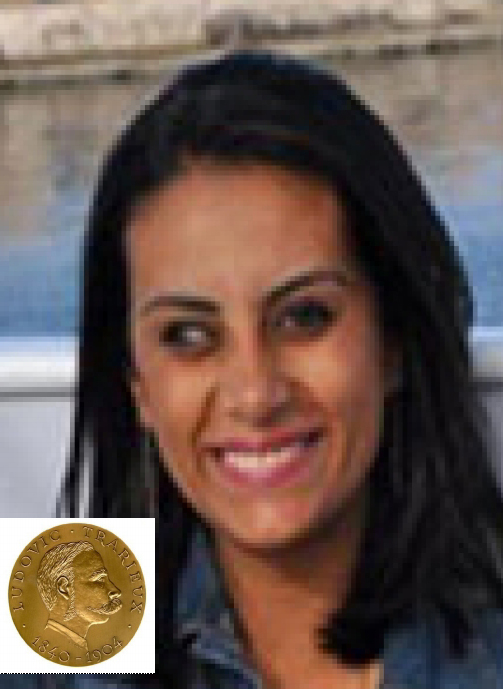 Mahinour al-Masry awarded "Ludovic-Trarieux" Human Rights Prize 2014. The Jury of 24 european lawyers, representing bars from Paris, Bordeaux, Amsterdam, Berlin, Brussels, Geneva, Roma, Luxemburg, and members of Union Internationale des Avocats ans European Bar Human Rights Institute (IDHAE) and of Union Internationale des Avocats (UIA)[i], meeting in Maison du barreau de Paris, awarded the 19th "Ludovic-Trarieux, to Mahinour al-Masry, a lawyer in Alexandria. Since May 20th 2014, she is serving a two-year jail sentence for organizing an unauthorized protest. The Jury launched an appeal to Egyptian authorities to release Mahinour al-Masry, immediately and without conditions. She was released on September 21st 2014. 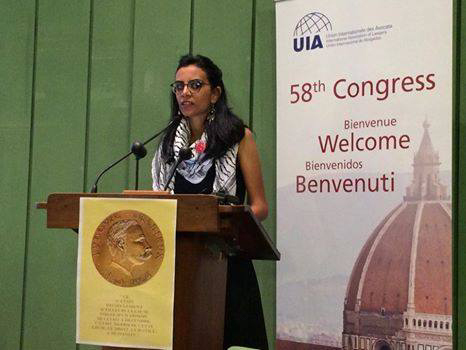 Mahienour el-Massry was invited in Florence (Italy) and received the Prize in a Ceremony, on October 31st 2014, on occasion of the Congress of UIA, in presence of worldwide coming lawyers. 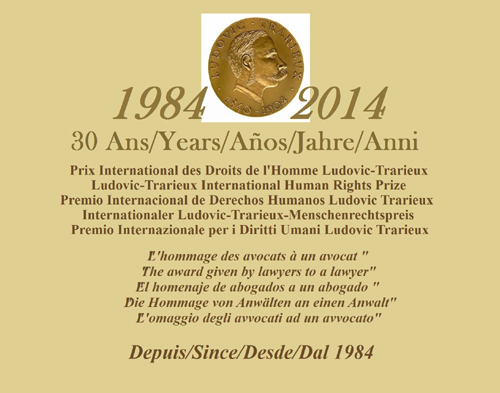 This European Prize, which is celebrating this year its thirty jubilee, is funded by main European bars and major lawyers organizations fighting for human rights. Known by most political activists, Masry is a member of the Revolutionary Socialists movement, and has always been outspoken as to the rights of detainees and political prisoners, with a history of activism in many labor movements, and on behalf of Syrian and Palestinian refugees in Egypt. Mahinour al-Masry, an Egyptian lawyer and activist who has been detained during the eras of both former presidents Hosni Mubarak and Mohamed Morsi, as well as during the current era of Interim President, now faces threat of imprisonment once again in the Mansour-Sisi era, as she preferred to name it. Masry and six others were detained on Dec. 2, 2013 in Alexandria for protesting without permission in front of the Alexandria Courthouse. They were protesting in solidarity with Khaled Said, whose brutal 2010 death while in state custody helped sparked the 2011 January 25 Revolution. Moreover, Mahinour al-Masry is also facing trial on separate charges for an incident that occurred in March 2013, qualified as “assaulting security forces”, after she and other lawyers went to Raml police station to provide legal assistance to three activists who were arrested and sent to the police by supporters of the Muslim Brotherhood. The lawyers were attacked by the police in the police station, and Mahinour al-Masry was detained briefly before the Prosecution decided to release her and the others. Lawyers in solidarity with the detainees have decided to carry-out a sit in at Al-Raml Prosecution to protest, then all protesters were beaten during the protest and 13 were arrested. The case was referred to court only on May 8, 2014, but the appointed judge resigned from the bench, and the next hearing before a different circuit is scheduled for end June 2014. During an interview with Al-Wadi, she declared that the regime is not different from Mubarak’s one, and that its actions took a more violent form, as state institutions have unanimously agreed upon suppression of human rights, namely that the government wants to suppress opinions under the cover of fighting terrorism. She continued that Mubarak imposed the state of emergency for thirty years using counter-terrorism as an argument, but this law was applied on all young people who demanded freedom and justice, and that military trials also included workers. She further noted that since the revolution, the Egyptian state did not undertake any laws to facilitate the restoration of companies that were privatized, or important companies, such as Ezz Steel, which still achieves profits, and its profits still go to Ahmed Ezz’s bank accounts. She further stated that in the case in which she was charged with violation of the protest law, she has been protesting with only 19 other demonstrators. She added that despite this, security forces attacked them with tear gas and arrested some of them. [i] [i] See ftnote page 2.